I have to confess that I’m a little bit addicted to the humble pin cushion! There are just so many ways to make them beautiful! Click HERE to see a few I’ve created in the past. 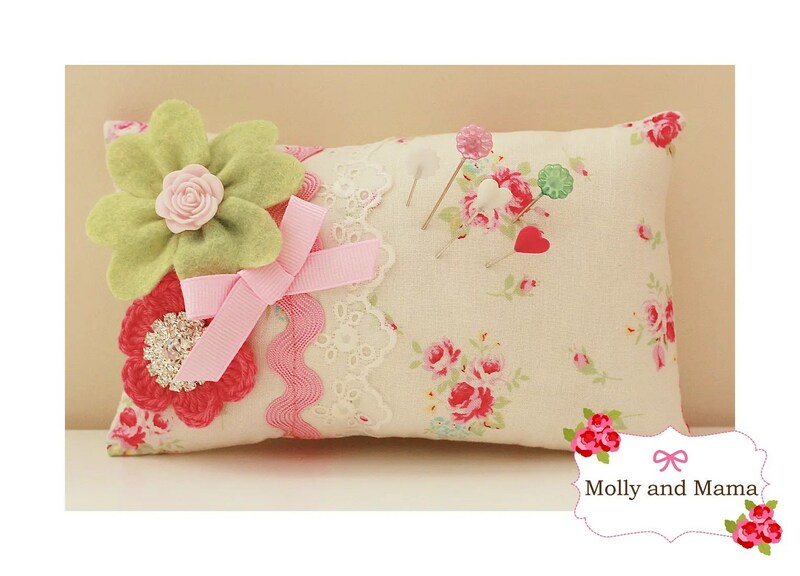 Pop by my Pinterest Pin Cushion Album HERE. And I even have a cute pattern available HERE. 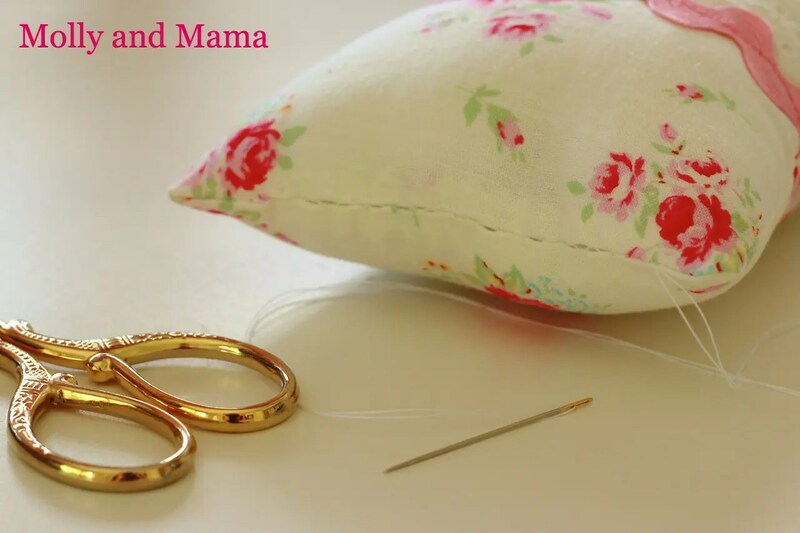 Here’s a simple and sweet pin cushion project that you can stitch up in no time. 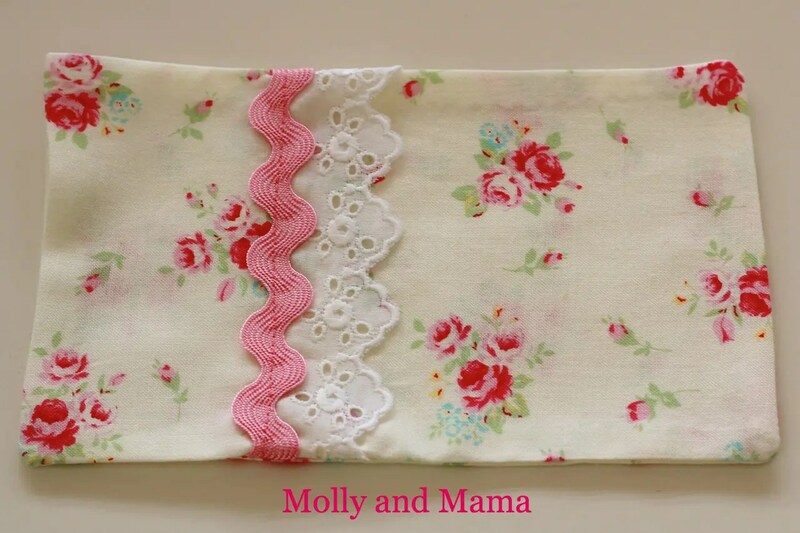 These make the perfect gift for a crafty friend and are a great way to use up your fabric scraps, and lace and trim remnants. At 4″ x 6″ they’re a handy size, but you can make them in any dimensions you wish. I’ve added a sweet wool felt ‘four-leaf clover’ (for a bit of added luck). So this tutorial is great for a Saint Patrick’s themed project too. If you’d like make your own four-leaf clover, you can see the tutorial HERE. Fabric scraps for the front and back. I used two pieces measuring about 5″ x 7″. Trim for the front (5″ in length). 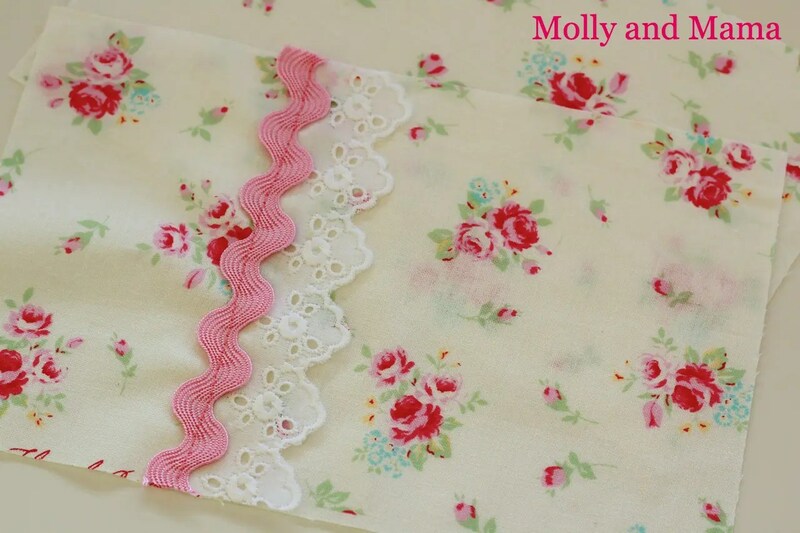 I used some vintage cotton lace from my mum’s stash, and a left over remnant of pink ric rac. Stuffing. I used hobby fill. Many use soft steel wool as it is great to help keeps pins sharp. 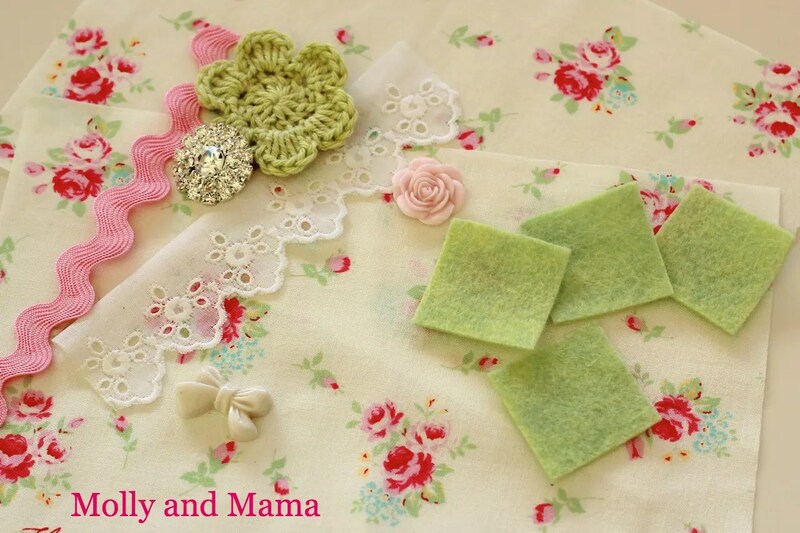 pretty buttons, flowers, bows and bits. Use up some goodies from your stash. Try different combinations together to get your prefered look. I didn’t end up using everything I chose in the beginning. Arrange your trims on the ‘right’ side of your top pin cushion fabric piece. Pin them down and stitch them in place on the sewing machine using coordinating thread. Place your two pin cushion pieces with their right sides together, and pin in place. Stitch a seam around three sides leaving one open for stuffing. I used a 3/8″ seam allowance. 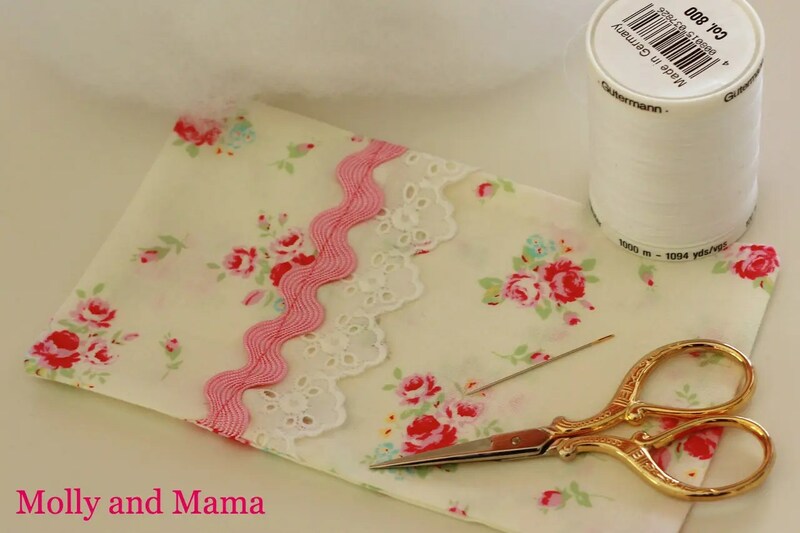 Trim your excess seam allowance with pinking shears or scissors on the three sides you stitched. Trim away the corners (being careful not to cut your stitching). This helps the pin cushion sit neatly. Turn it out the correct way. Press your pin cushion and press your side seam allowance under. You’ll use it as a guide for hand stitching. Stuff your pin cushion firmly. Use the point of your closed scissors to gently manoeuvre stuffing into the corners. Double the thread on your needle and secure the end with a knot. Using a neat and small ladder stitch, sew up the seam of your pin cushion. Now it’s time to decorate! 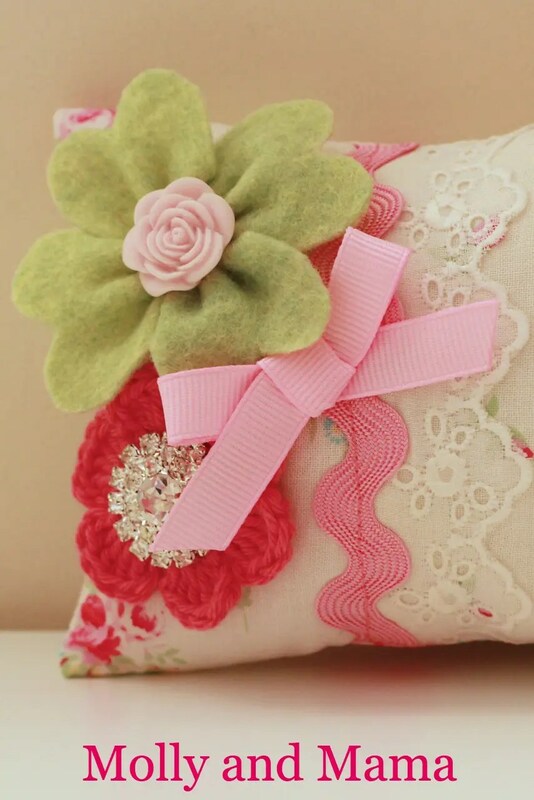 I carefully stitched on my felt clover, crochet flower and ribbon bow with carefully hidden stitches. I then used hot glue to attach my resin flower and diamante button. Add your sewing pins and you are all good to go! Some people love to stuff pin cushions with soft steel wool as it helps keep your pins sharp. You can also add sand to your pin cushions to help give it weight. Use an extra piece of fabric to double your pin cushion top. The two layers on the top give it extra durability. I’d love to see your pin cushions! So feel free to share your own projects. And let me know if you have some other great tips and tricks for our readers. I found this gorgeous project while searching for some St. Patrick’s Day Crafts. Enjoy! Are those gingher scissors I spy! This is super cute, I like the green and pink combo. Thanks so much Swoodsonsays! I must confess that pink and green is my favourite colour combination!